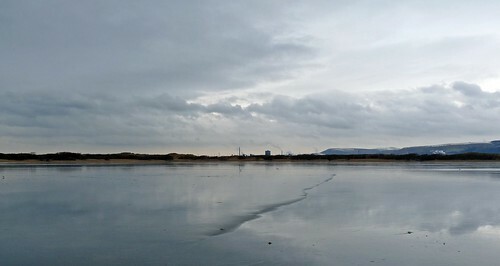 The view that greeted me at Kenfig NNR today was one of almost complete desolation. The lake was almost entirely frozen over (and to quite some thickness at that) whilst the surrounding ground was as solid as rock. I had been hoping to see one of the Bitterns that have been hiding around the reedbeds but those plans were soon dashed by the numerous people who were walking on the ice right through the reeds and in some cases in front of the hides. If a Bittern had been present it would almost certainly have moved off by now. A good scan of the ice revealed nothing more than a hundred or so Black Headed Gulls mixed in with a smattering of Herring and Lesser Black Backed. I was very pleased to also see a couple of Common Gulls, yet another virgin location for this species and me after Penclawdd yesterday. I don't know what their usual range is but I would be interested to see if this cold weather has been pushing them further afield. The only patch of open water was jam packed with Coot and Mallard with a pair of Tufted Ducks also present. A larger flock of Tufted's had made a brief fly past but obviously hadn't liked what they had seen. In the surrounding fields good numbers of Redwing and Fieldfare could once again be seen foraging for food, whilst a single Meadow Pipit and female Reed Bunting added a couple of new ticks to the year list. Several Wrens were also noisily moving around the undergrowth though what they were finding to eat I don't know. The dune system didn't offer anything beyond yet more Redwing and a single Snipe. One encounter from the day sticks in my mind and probably typifies the conditions being experienced elsewhere. Whilst scanning some reeds a Robin came very close onto the ice in front of me and spent the next five minutes or so hopping around and pecking at the ice. Whether it was trying to get at bits of food trapped in the top of the ice (unlikely) or attempting to get at some fresh water (more likely), it certainly appeared to be fairly desperate. In these conditions it is vital that you put out food and also some form of water supply. It may not seem like much but these small efforts may be the difference between life and death for large numbers of our feathered friends this winter.